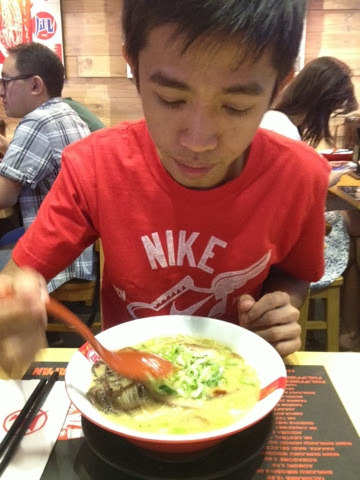 Ramen Nagi is actually the Cheese and I's first ramen date together. Most of the time, my ramen dates are with friends and colleagues which is awful, I know. 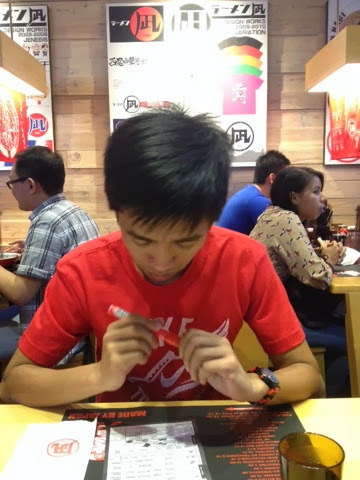 Pero naman, our first ramen date is sorta bongga kasi Ramen Nagi agad! 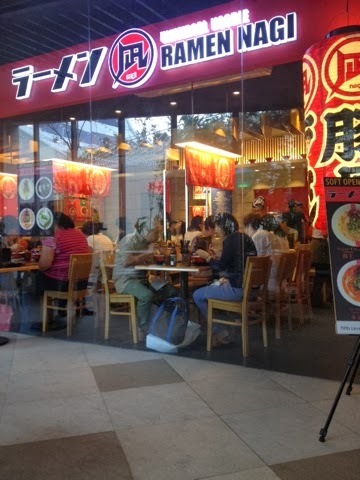 Ramen Nagi is hailed as Tokyo's best ramen lang naman kasi for 2 consecutive years (2011 and 2012)! We arrived a little before 2 in the afternoon and was surprised with a number of people waiting in line to be seated. Nakakaloka. Alas dos na ang dami pa ring gustong mag-ramen. I took it as a good sign though, lam mo na basta may pila dun ka na! As it turns out, we didn't have to wait that long. Wala pang 15 minutes our names were called. Hooray! We were seated in a long table along with 2 other pairs of customers. Legit ramen joint! Then the waiter poured our glasses with their house tea that has a distinct taste to it. 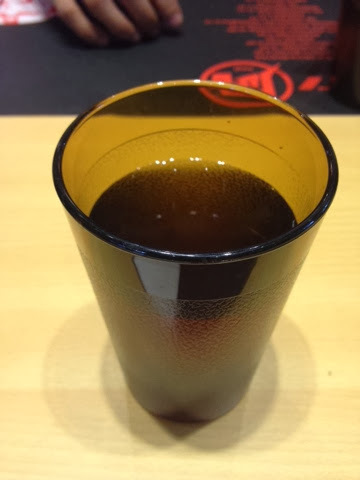 It's like a combination of rice and tea. So good! 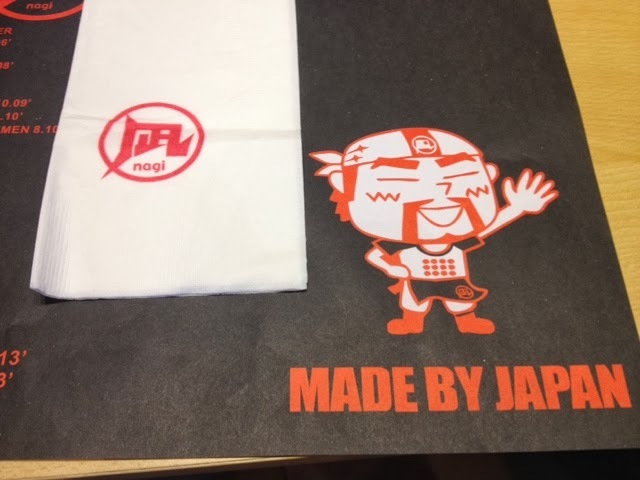 We were also handed a paper where we would choose our orders. I didn't get to take a photo of it, sayang! But here's the Cheese mulling over what to order. I ordered a Black King with normal garlic and onion toppings with pork belly as my meat. I also circled 1 on their spicy meter because that is what's recommended in the paper which I later on came to regret haha (not a fan of spicy foodams). Paano pa kaya ang 6-10 spiciness level!?!? 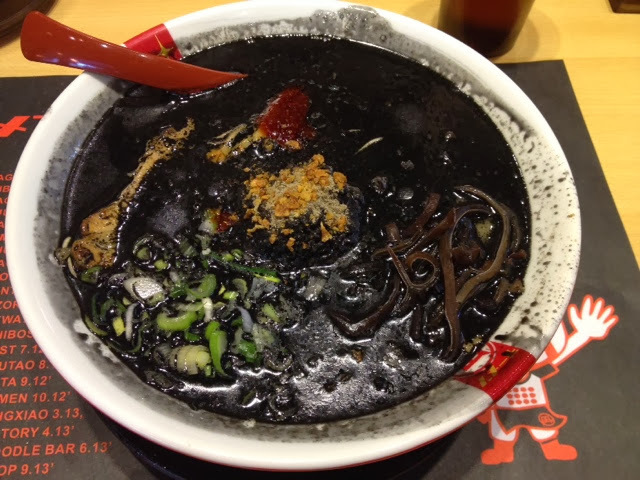 I love the richness of this black butao ramen. They most definitely did not scrimp on the ink because it's (obviously) there and you can taste every bit of it. Also, I'm glad that I opted to have my noodles hard making all the difference from the normal noodles! Medyo nag-alangan pa ko na kunin yung extra-hard (like what every blog recommends) when I had nothing to be afraid of. I like its firmness, no more, no less. The Cheese ordered the original king butao (which I got to taste as well). It has the milky richness in it just like the ramen I had in Keisuke Tonkotsu King at Singapore (which only has positive reviews as attested by the long lines of customers waiting to try their ramen). So after about 30 minutes, we came out of Ramen Nagi feeling all satisfied and bundat from all we've eaten. I want to try the Green King next, see if the Japanese/Italian fusion works for me. I hope we can try Yushoken on South as well pero kasi naman sobrang layooo! I really want to try and see/taste for myself if what everyone's raving about is indeed true. As if naman I would know the difference but let's just say I can. lol.